Whether you’re just visiting France or living in France, here are the dates, a timeline and list of France’s 11 public holidays, 5 French school breaks plus a few French celebrations and festivals such as mothers day and Carnival. A public holiday or bank holiday is called a jour férié in French and French people usually get the day off from work and school. I say usually because there are exceptions such as hospital staff and law enforcement which are crucial services that can’t stop. What this means for you as a tourist or local is certain businesses, banks, grocery stores and some tourist attractions may be closed or have reduced hours. Public transportation may have reduced frequency or completely stop; it just depends on the bank holiday and the region. Moveable Feast: Can occur in March or April. The day after Easter, Easter Monday is always a public holiday in France. Easter is a moveable feast whose date changes and can fall anywhere between Mar. 22 and Apr. 25. Its calculation is based on an ancient ecclesiological computation. The first Sunday after the first full moon after the spring equinox on Mar. 21st. is always Easter Sunday. 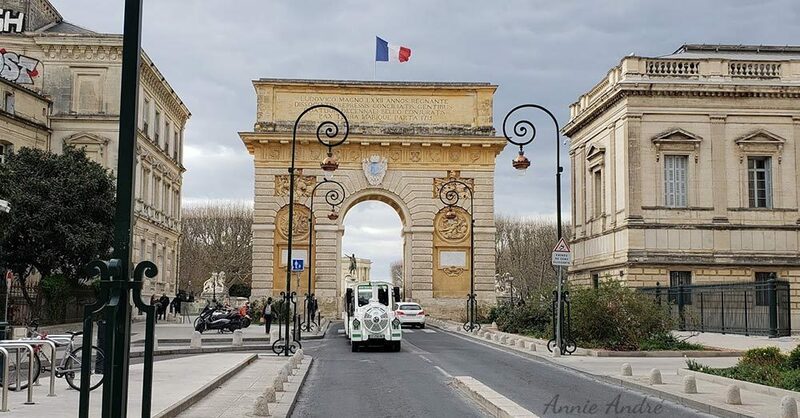 The month of May has the most combined public holidays and celebrations out of any other month of the year which can be kind of a pain for tourists and locals because many businesses, services and tourists sites are closed and public transportation runs less frequently. Although there are 11 public holidays in France where workers and students get the day off, Labour day is the only day where employers must pay employees for the day off. All other days are at the discretion of the employer. May first is also la fête du Muguet (lilly of the valley celebration). Victory in Europe day, also known as VE day and V Day commemorates the end of World War II in Europe. Moveable: Always on Thursday, it’s the 40th day of Easter. When a French holiday falls on a Thursday, employees and student in France often take a long weekend (FAIRE LE PONT) which literally it means TO MAKE THE BRIDGE. Since Ascension Thursday is always on Thursday, you can always count on Friday off and a wonderfully long four day weekend. Moveable: 50 days after Easter Sunday. Pentecost is a day when Christians celebrate the gift of the Holy Spirit. It’s also regarded as the birthday of the Christian church and the final celebration of the seven-week Easter period. The Monday after Pentecost, Pentecost Monday also known as Whit Monday is a Public holiday in France. The date is moveable-based on the date of Easter. Bastille day is France’s national day or Independence day and it’s one of the most widely celebrated holidays in France. It commemorates the storming of the Bastille in 1789. Just like Americans see the 4th of July as a day to celebrate being American, the French see their Bastille day or “quatorze juillet” as a celebration of being French and patriotic…Here is an interesting look at some of the similarities between France’s Independence Day vs. American Fourth Of July. This is a Catholic holiday which celebrates the day Mary, the mother of Jesus is resurrected and taken bodily to heaven. Many families take this time to enjoy time together with family. Just an FYI, Thanksgiving is not celebrated in France; however, most French people are aware of it thanks to shows like Friends. Here is what French people might find weird or surprising bout a American Thanksgiving Traditions. La Toussaint or All Saints is a Catholic holy day. It’s more of a private family affair where families place flowers on graves to honour their dead. Armistice celebrates the end of WWI. The US used to call this day Armistice also however it was changed to Veterans day in 1945 by President Dwight D. Eisenhower. In the UK and Canada, it’s called Remembrance Day. There are just too many French celebrations and festivals to list so I’ve only included 13: some of the more popular, notable or some that require more explanation such as Halloween. It’s also the beginning of the infamous Carnival season in France. On February second, while the US and Canada are celebrating groundhog day and waiting for the groundhog to poke its cute little head out of its hole, French people celebrate Candlemas known as “La Chandeleur” by eating crepes. Here is a little backstory on why it’s tradition to eat crepes on this day. Moveable- Can occur in February or March. Fat Tuesday which means Mardi-Gras in French is always on a Tuesday precisely 47 days before Easter and one day before Lent / Ash Wednesday. This day also marks the end of the carnival festival season. Saint Patrick’s day isn’t really celebrated in France except by expats and some open-minded and adventurous French people who head out to their local Irish pubs if any exist in their town. Poisson D’avril literally means April Fish in French. Kids in France love to stick a paper fish on the backs of people as a prank. Why Is April Fools Day In France Such A Fishy Affair? In France May first is not only labour day, an official public holiday, it’s also la fête du Muguet. Muguet is a Lily of the valley flower (a small plant with large green leaves and fragrant white flowers shaped like tiny bells). It’s customary to offer “les Muguet” to friends and family. If you offer a sprig of Lily of the valley flowers with 13 bells, it’s supposed to bring you extra good luck. Usually the last Friday of May. Throughout France, on June 21st (summer solstice) people are allowed and urged to play music in public spaces and parks. Free concerts are also organized, where musicians play for fun. The music is usually an all-day event and can sometimes last late into the night. Here’s the official website from the minister of culture in France. I’ve written two other articles about Halloween in France. The school year in France for all children begins the first week of September. In addition to the 11 annual bank holidays, kids also have five school breaks. Each one last around two weeks except for the summer holiday which lasts about two months. If you’re a parent working or living in France, it’s important to know these holiday dates so you can make your holiday plans or arrange for childcare. 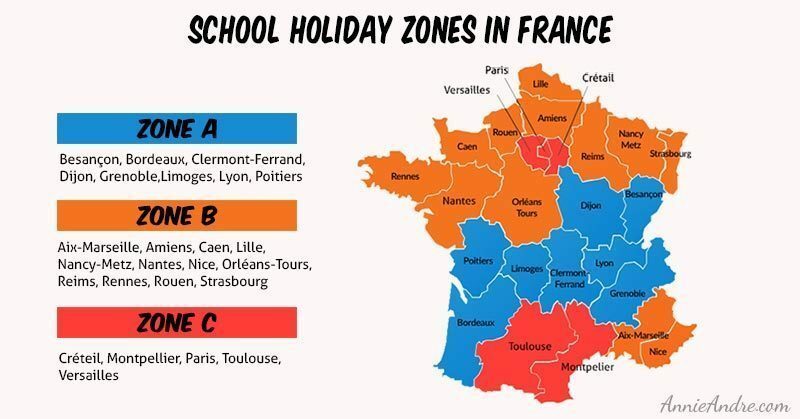 If you plan on visiting France during these school breaks, be aware that many popular vacation spots will and can be overrun with French families on vacation. Kids in France can look forward to a long summer vacation which begins the first week of July through the first week of Septembre. Novembre 1st is “Toussaint” or All Saints day in France (A public holiday). French students get a little over two weeks off for the Toussaint holiday which usually begins the third Saturday of Octobre until the First Monday after the first of Novembre. The Christmas holiday break, not to be confused with the winter holiday break lasts a full two weeks and usually begins on the Saturday before Christmas day through New Years. Kids typically return to School on the first Monday after January first. Winter holidays last two weeks and begins mid-February to the beginning of March. The exact date depends on your locations school holiday zone. (There are three school zones, see map below for distribution). Formerly known as Easter holiday, Spring break begins in April and lasts for about two weeks, sometimes running into May. Like the winter holiday, the exact date depends on your zone location. The reason behind this is purely logistical, to avoid traffic jams from everyone taking to the roads and overrunning popular tourist destinations all at once. To get the exact dates of school breaks in France, I use this government site. In addition to the 11 public holidays, there are also regional public holidays such as Good Friday which is only a bank holiday in Alsace and Moselle France. The same is true of certain celebrations and observances such as the tradition of carving grimacing beet lanterns “les Betteraves Grimaçantes” also known as “Rommelbootzen” in German, specific to the historical region of Lorraine in northeast France which borders Belgium, Luxembourg and Germany. You can read about here.